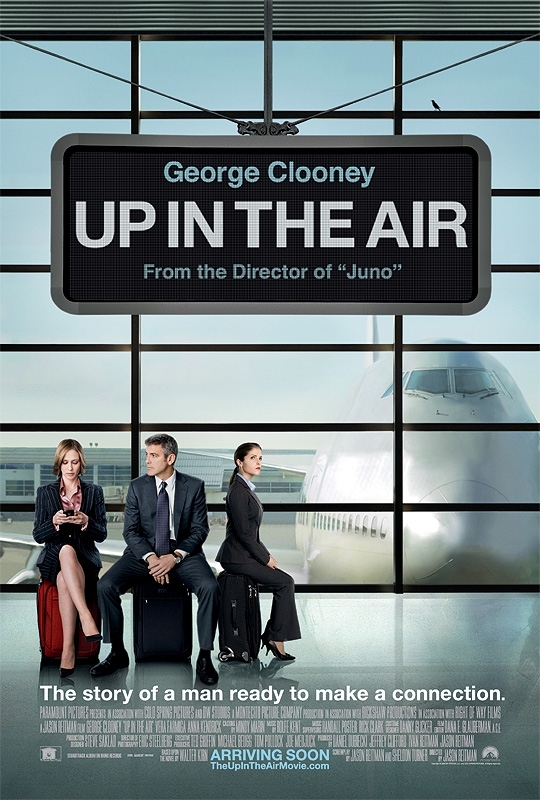 Emily and I recently saw Up In the Air, a Jason Reitman (most notably directed Juno, one of my personal favorites) penned and directed film. Although our intentions that night were to see Avatar, I was thoroughly not disappointed by the results of this film. First, the dialogue was phenomenal. George Clooney, as Ryan Bingham, was phenomenal. I usually think of Clooney starring in action, fast-paced fun moves (such as the Ocean movies) or in goofy roles (O Brother Where Art Thou / Men Who Stare At Goats). However, the quirky, realistic drama role fit him perfectly. His co-stars of Vera Farmiga (as love interest Alex) and Anna Kendrick (as co-worker Natalie) were a superb fit. The only disappointment was that there weren’t more scenes with Zach Galifianakis (The Hangover)! More importantly, I enjoy movies whether they are seriously entertain or stir something inside of me. I am rarely more angry after spending 2 hours watching a pitiful film. He is the epitome of self-centered living. His life is all about his airline miles (seeking to reach 10 million miles), his bonus cards at hotels and car rentals, and airline travel. Alex, a woman he meets while on the road, appears to fit symmetrically with Ryan. She is the woman version of Ryan. They develop a romantic interest and Ryan begins to wonder if life might be better with two (rather than one). Natalie, a recent graduate of Cornell, has received attention from the boss of their company to revamp the company. She has created a video conference program that allows clients to get fired via video conference rather than in person. She is forced to travel with Ryan in order to learn the ropes. Enough of the summary. Go see it. What makes this film “well-done” is the way it surveyed themes without making it obvious which way was more “appropriate” or not. It gave space to the viewer to choose what was “right” and what was “wrong.” It opened doors without trying to show the obvious way to close it. It’s no spoiler by now: Ryan and Alex develop a romantic, sexual relationship. Ryan begins to fall for her, believing she was single. Up til this point, he had zero interest in marriage or kids (more on that later). So, Alex has thrown a serious wrench in his life machine. As he walks off stage giving his “backpack” talk (where life is better with an empty backpack), he heads to her home in Chicago (DON’T READ ON IF YOU DON’T WANT TO BE SPOILED!). When he shows up, he finds her with a family and a husband. She calls and asks what he was doing. That was her real life, she said. He is just a PARENTHESES and an ESCAPE from real life. She doesn’t apologize for this being the case and in fact, tells him to call her if he wants to see her again. Here’s the issue: Life is more fragmented and segmented than ever before. We live in an era that allows (celebrates? Endorses?) multiple lives and segmentation. Integrity is not a virtue any longer. To be Johnny Party Animal, Johnny Church Goer, Johnny Devil Worshipper, and Johnny Sweet Child to all kinds of different people without a blink of an eye is not only done, but wholly accepted. Need an escape from “real life?” Then just go GET IT. Apologies are heeded only after being caught (see Tiger Woods, Senator John Ensign). Integrity needs to be re-valued on all levels of life. In a world dominated by celebrity views and media, we get all kinds of quacky beliefs and statements about “doing what you want” and “following your heart” – no matter the cost! It used to be that the cost of a “parentheses” was too high to consider. Now, the “parentheses” is sought after! 2010 dream? No more “escapes.” No more parentheses for everyone. Live lives of integrity. On one hand, we witness the passion and “idealism” of young Natalie. She is full of vigor, intelligence, and passion. At one point, her boyfriend breaks up with her and she is devastated. As she discusses her life desires with Alex and Ryan, they begin to tell her eventually she’ll “grow up” and hope for just the basics. Eventually, she quits her job because she doesn’t want to settle. Here’s the dynamic at play. There’s the passion and dreams of a young, recent graduate, and the hard realistic life views of Alex and Ryan. What’s more desirable? On a quick side note, as I was discussing my year with my friend Evan, he told me of how he was going to either react or overreact, but just not underreact in 2010. I really liked this, because we are both passionate people who are driven by challenge and reaction. To underreact is to simply lose before you play. In 2009, I slowly slipped to underreaction. Why? When I reacted or over reacted (my natural state), I was either treated with a mocking pat-on-the-back as if I were a young, “idealistic” child or burned by people who hurt me. The point is this: Passion and the desire to not settle is not an unworthy dream. Ryan and Alex are just under reacting. They’ve decided if they don’t have expectations, then they can’t be hurt. They refuse to get off the sidelines and into the game any longer. They’ve relegated themselves to the bench. If you don’t play, you can’t lose, they reason. For me? I want expectations. I don’t want to settle. I want to react or over react. I would rather get burned or mocked REACTING IDEALISTICALLY then to sit back and settle into a dull life lacking expectations in the name of REALISM. I believe Jesus wants us to experience life and life to the full. This is done IN THE GAME and not losing our hopes, our dreams, our desires, and our longings for something more. I hurt for Ryan. When he finally decided to go for Alex and leave his selfish life and empty pursuits behind, he thought it’d all be well. He finally gathered the courage to step out. Instead, he got burned. Life doesn’t have to be that way. True, we’ll step out and get burned, but that doesn’t mean when chasing The Goods we will always get burned. Again, credit to Evan for this thought, but especially in Christian circles, marriage is made an idol. Most of the time in movies, relationships are the goal and the gold at the end of the rainbow. In other words, marriage = good. Single = bad. I know I go against most popular Christian views in this regards, but marriage is not the ULTIMATE in life. Yes, it is incredible. There is something deeply spiritual about two becoming one. I love my wife more than anything in this world. I wouldn’t trade being married for anything in this life. However, we’ve made an idol out of marriage. Ryan doesn’t want to get married. He doesn’t want kids. What’s wrong with that? Absolutely nothing. I appreciated the way this film portrayed both lives as equal. Alex isn’t living the dream because she’s married with kids (in fact, she’s having an affair!). Ryan isn’t living the dream because he’s single, but he seems content with life enough. Conclusion: I’m a big goals guy. Therefore, I love New Year’s Resolutions. However, I’ve had difficulty settling on some this year. I recently read Donald Miller’s post about Resolutions. That, combined with this movie, I’ve settled on some. * A life without parentheses or escapes or even desires for one. It would be a life of deep integrity. * I will celebrate my passionate “idealism” and refuse to give into the bench warming views of realism. * Support people on their chase of “The Goods” through the development of a Healing Ministry at The Garage. * Provide support for marriages and prevention of divorces. I will work to create more opportunities for current marriages to grow. Divorce is an epidemic. There is much more at work in this film than I analyzed in this post. These are just a few of the stirrings this film created in me. I hope you go see it and let me know your thoughts! Saw your comment at withoutwax. Here are two books — one current, one future — you might appreciate.